Windows are an important part of any home, from the light they let in to views they reveal. However, they also create a host of problems ranging from excessive glare, heat build-up and high energy costs to the premature fading of carpets, furniture and draperies. CB Tint solar reflective films for your home can help you control these problems while providing increased comfort and lowering overall energy costs. 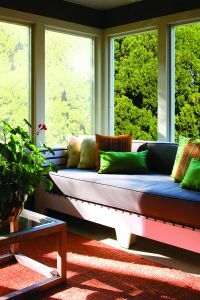 Windows are key to regulating HVAC usage in your home, whether you live in San Francisco, Sacramento or San Jose. But according to the EPA Energy Star Buildings Manual, in the United States, approximately 50% of an average home’s utility bills is wasted through heat loss and gain from untreated windows. CB Tint residential window films can lower heating and cooling expenses by rejecting solar heat from the outside, eliminating hot and cold spots inside, and helping to prevent heat from escaping. Most fabrics, furnishings and artwork can be damaged and fade simply by allowing daylight to pass through an untreated window. By blocking more than 99% of all UV rays, CB Tint home window films will help preserve the color of your furnishings, fabrics and carpets, and help protect fine antiques, woods and works of art from discoloration and fading. Even more important, residential window tinting can defend your family members against eye and skin damage caused by the UV rays that sneak inside. Open your blinds, shades or draperies and let the sunlight in. CB Tint home window tinting reduces glare by up to 87%, making it easier for you to watch television or work on a computer. And because our window films are available in a variety of light and subtle shades, you’ll be able to enjoy your view without even knowing they’re there. Protect not only your home, but your family and belongings as well with sun control window tinting. Talk to a residential window film expert today at CB Tint in Campbell and get a free estimate on making your home safer and more comfortable.